DLIFLC is DoD’s premier school for culturally based foreign language education and training, with classroom instruction, mobile training teams, and online materials tailored for students at all levels of required proficiency or performance. The institute is attended by all four branches of the military service and select individuals sponsored by their agencies. An estimated 5,000 people attended DLIFLC’s annual Language Day Open House event on the Presidio of Monterey. It was a fun-filled day with more than 40 cultural performances, dance, song, special presentations and classroom demonstrations. More than 230,000 students have graduated from the Institute and its programs since its inception in 1941 at the Presidio of San Francisco, only six weeks before Pearl Harbor. 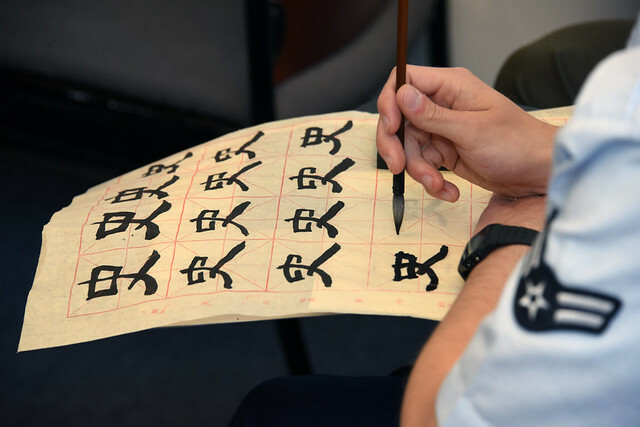 Learn about how to become a linguist at the Defense Language Institute Foreign Language Center, one of the most elite educational institutions in Department of Defense. Come teach one of more than two dozen foreign languages taught at DLIFLC in beautiful Monterey, California and be a part of one of the largest language schools in the world. If you were to ask the average service member, chances are they would not equate military classes with a flexible learning system. The military, perhaps by definition, is rigid with rules and regulations. The Hebrew classroom here at the Defense Language Institute Foreign Language Center is very different. Be careful what you wish for if you’re a Defense Language Institute Foreign Language Center graduate! You could easily end up catapulted into a world crisis where leaders are clinging to your every word, making crucial national security decisions based upon the information you provide them. It’s not often you can say you attended school with your future father-in-law. When Pete Weldon attended the Defense Language Institute Foreign Language center to study Korean in 1957, he began dating Marcia Houston, only to discover her father, William Houston, was also at DLIFLC, studying Mandarin Chinese. The words inscribed at the feet of Lady Liberty, “”Give me your tired, your poor, your huddled masses yearning to breathe free…,” might well have been written with someone like Waseem Abdo in mind. Language Day is May 10th! Rapport includes six to eight hours of language and culture pre-deployment training. It is mandatory training for all civilian and military Army personnel deploying to Iraq or Afghanistan. Available in Dari, Pashto, Iraqi, Swahili, Hausa, Portuguese, French, Modern Standard Arabic, and Korean. Headstart2 is 80 to 100 hours of self-study pre-deployment instruction designed for the training of one small unit leader per platoon. The lessons contain interactive tasks, language-specific pronunciation guides, and cultural familiarization and orientation modules. Headstart2 is available in a stand alone (DVD format) or on-line version. Cultural Orientation introduces a given cultural group, combining brief language exchanges with an objective and practical look at daily life in different contexts. Topics include religion, traditions, family life and differences in the lifestyles of urban and rural populations. These country studies begin with a country profile containing basic facts, followed by a more detailed discussion on geography, history, economy, society and security. This self-paced, interactive introductory language course in Swahili uses videos and multimedia activities to introduce Swahili language and culture. Topics include: basic greetings, travel phrases, numbers, time, currency, and making appointments, among others. Language Survival Kits include text, audio recordings, and translations for up to 3,000 mission-related phrases. Take an online test to estimate language proficiency in reading or listening. ODA helps learners determine the subject areas and language specifics to improve, with customized suggestions for GLOSS lessons to help reach proficiency goals. Test your familiarity with a particular society, including geographic facts, major religions, history, security situation, social customs, and basic survival phrases in the dominant language of the region. GLOSS The Global Language Online Support System offers thousands of lessons in dozens of languages for independent learners to improve their foreign language skills.Lessons are available for intermediate and advanced learners, with the ability to focus on specific topic areas, tailor ed for building listening and reading proficiency. Organized in four hour blocks, these in-depth GLOSS lessons are designed to help Command Language Program Managers provide packaged materials to professional linguists. These supplementary materials for North Korean dialect language learning can be incorporated into basic, intermediate, or advanced courses to provide students with cultural and regional information about North Korea. Familiarity with regional dialects and realistic dialogues is key to achieving advanced listening proficiency. This site contains more than 300 casual phone conversations in non-standard dialects of Spanish and Arabic. Arabic materials also include lesson plans for classroom use. Available in Spanish and Arabic, this product offers a collection of audio files read in both “standard” language, and in several regional accents to illustrate dialect variations that occur in everyday speech. Have you forgotten a fine point of Arabic grammar? The Arabic Grammar Search takes you inside the language with complete A-Z search and help functions. The views expressed in those publications are those of the authors, not the Department of Defense or its elements. The content does not necessarily reflect the official US Army position and does not change or supersede any information in official U.S. Army publications. Editor reserves the right to edit material. Prospective authors should consult previous volumes of the publications and Information for Contributors published in each issue. The GLOBE is an authorized publication under the provisions of AR 360-1 and the Associated Press Style Guide for members of the Department of Defense. Contents of the GLOBE are not necessarily official views of, or endorsed by, the U.S. Government, Department of Defense, Department of the Army, or DLIFLC. The GLOBE is published by DLIFLC Public Affairs Office. The DLIFLC General Catalog provides constituencies with precise, accurate and current information to include general information pertaining to DLIFLC, admissions and academic requirements, course descriptions, and major policies affecting students. All catalog years are listed. If the year you need is not listed, please see the catalog prior to that year. Example: If you want to look at information for 2005 courses, see the 2003 General Catalog. The mission of Applied Language Learning is to provide a forum for the exchange of ideas and information on instructional methods and techniques, curriculum and materials development, assessment of needs within the profession, testing and evaluation, and implications and applications of research from related fields such as linguistics, education, communications, psychology, and the social sciences. Dialog on Language Instruction is an occasional internal publication of the Defense Language Institute Foreign Language Center (DLIFLC) and part of its professional development program. Its primary function is to promote the exchange of professional knowledge and information among DLIFLC faculty and staff and to encourage professional communication within the worldwide Defense Foreign Language Program. To watch our live stream feeds, when available, please click here.